A popular ornamental tree on account of its shimmering foliage and fragrant white flowers, Sweetbay Magnolia (Magnolia virginiana) is a small to medium-sized tree found along the eastern seaboard from Massachusetts to southern Florida and west to southeastern Texas. In the northern parts of its range, this tree usually maxes out at about 20 feet-tall and drops most or all of its leaves in the colder months. In the south, it can grow up to 60 feet-tall, retaining most of its foliage throughout the year. The most distinctive feature of Sweetbay Magnolia is without question its blooms - showy, creamy white, lemon-rose scented flowers. These cup-shaped blooms can measure 2 to 4 inches across, appearing from May to July. In autumn, flowers give way to attractive seed cones, which are cob-like in shape and dripping with deep red seeds - a feast for the birds. Leaves are a sparkling green above and a ghostly pale beneath, growing up to 8 inches long and 3 inches wide. When rustled by the wind, the two-tone quality of the leaves' coloring can create a beautiful shimmering effect. Bark is thin, smooth, gray, and aromatic. Sometimes called Swampbay, Sweetbay Magnolia typically grows in wet acidic soils near ponds, streams, rivers, and coastal swamps. Its soft wood and fleshy roots happen to be a favorite of beavers, giving rise to another of its common names: Beaver Tree. Sweetbay Magnolia is an excellent ornamental tree for small residential properties, and is especially lovely near water. About Jonsteen's Seedlings: All of our trees are seed-grown - without poison or pesticides - at our nursery on California's Redwood Coast, which is inspected monthly and licensed by the California Department of Agriculture. About Jonsteen's 100% Guarantee: All of our trees are guaranteed to arrive healthy and in good condition. If your tree perishes, we will replace it with a small-sized seedling for just the cost of shipping/handling ($4.60). Grow your own Sweetbay Magnolia (Magnolia virginiana), popular for its manageable size, shimmering foliage, and fragrant white flowers! 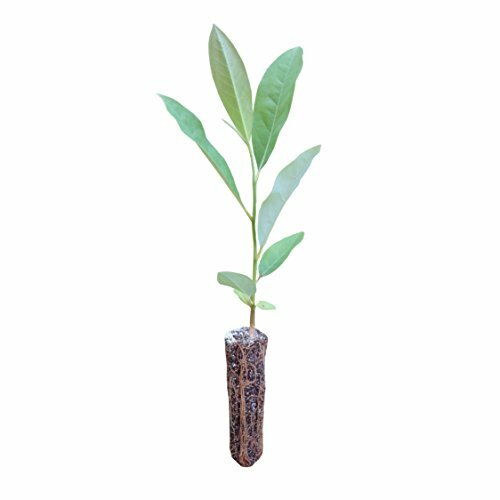 Trees can provide a natural barrier against high winds, temperatures, noise pollution and soil erosion, all while benefiting local air quality, wildlife and property values - a Jonsteen seedling will only grow in value and beauty! If you have any questions about this product by The Jonsteen Company, contact us by completing and submitting the form below. If you are looking for a specif part number, please include it with your message.